The stable's great run continued on Seymour Cup day with tough galloper Izenashark saluting at his first run back from a spell - making it three winners from our last three runners! Jumping well from an inside gate, Izenashark travelled nicely for Mitch Aitken but did have company on his outside. Gaining the lead turning, Izenashark was challenged all the way down the straight but gave a nice kick close to home, putting 1 3/4 lengths on his rivals... doing a great job at his first run since late April. "He came back in fantastic order from his spell," Allison said, "and he trialled really well last week." Whilst the 1200m of the BM64 was short of Izenashark's best, Allison was confident of a bold showing - "we knew he was on the job and ready to go today." But the best is to come with the son of Sharkbite at his best over a bit longer. "The plan is to step him up to 1400m pretty quickly." A winner for us late last year, Izenashark is into his second preparation for the stable with Allison confident that she now has a handle on him - "we have got a better idea of him now, we know all his quirks and we are really pleased with his effort today." Mitch Aitken noted Izenashark was a little on the fresh side - "he was quite keen first up" - and that there is improvement in him. "He will be all the fitter and better next start." 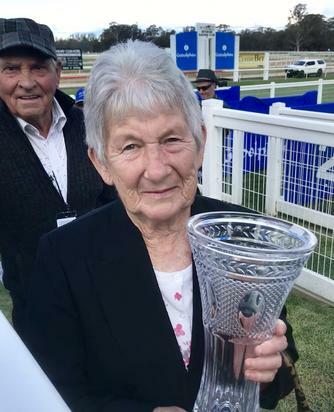 Congratulations to Izenashark's happy owners including manager Shannon Cantwell and her grandmother Mordi Wanhope who bred the consistent six-year-old. Izenashark's sire is Sharkbite (also sire of our recently retired Andrassy who has tested in foal to the multiple Group One winning sprinter Dream Ahead) whilst his dam is the two times winner Lady Zena... also dam of the winners Blazena and Mister Zao.